Parents considering new schools for their children examine many factors and while specific priorities may vary, there is one thing families consistently tell us. When it comes to assessing schools, they value objective facts as well as the subjective opinions of others. At GreatSchools, we gather facts and opinions and present them in an accessible fashion so parents can feel confident in their decisions about their children’s education. It’s no small task. With 130,000 K-12 schools nationally, providing a rich profile of each school means gathering information from multiple sources. Getting input from the millions of parents, teachers, administrators and students who visit our site each month plays a big part. You are the ones who know your school best. Write a Review: More than a million people have posted a review about their school on GreatSchools. Keep them coming! Reading first-hand perspectives is illuminating. New families, especially those who are relocating and may not know people in their new community, read reviews to get the inside scoop on a school. To get the 2013-2014 year off to a great start, we’re running a Back-to-School Sweepstakes. Schools with at least 3 new reviews in a calendar month are eligible to win $5,000. Best of all, there are 3 chances to win with monthly drawings in August, September and October. Answer a School Questionnaire: We’ve just rolled out a *new* online questionnaire aimed at those of you who know a school directly. 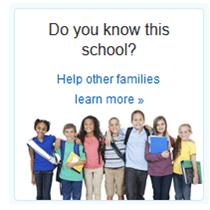 When you visit a school profile that doesn’t have any information provided by a verified school leader, you will be prompted to answer a few questions, for example whether your school has specific programs, extracurricular activities or extended care. There are nine questions. So it only takes a minute or two to share what you know. Consider this an open invitation. Come one, come all. Show us your school pride!